Need a side dish that packs a punch of flavor? 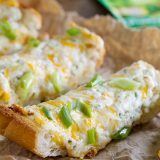 Try this Ranch Cheese Bread that comes together in well under 30 minutes! In a large bowl, combine the cheese, yogurt, butter and dip mix. Stir until completely combined. Cut the loaf of French bread in half horizontally. Place cut side up on a baking sheet, and spread half of the mixture evenly over the inside of each half of the bread. Bake in the center of oven for 10 minutes. Turn the oven to broil and move the rack about 6 inches from the top. Broil the bread until the edges are browned and the cheese is bubbly. Sprinkle the top of the bread with the green onions. Let it sit for a few minutes before slicing and serving.